Discussion in 'Test Update Notes and Bug Roundup' started by EQ Dev, Jun 20, 2018. Fixed an issue affecting AB and agnarr with marketplace purchases. They should now work again. Two pieces of Berserker only HH Sebilis gear have the wrong slots. Echo is still up in seb? Not sure how long till he's supposed to despawn. The client crashes when loading a character using a custom UI. No errors are seen in UIErrors.txt. I did have to clean up EQUI_RaceChangeWnd.xml to purge all references to male icons. Before doing that the game loaded, but switched to the default skin because of the errors in RaceChangeWnd. Oddly, I can use the exact same UI files on other accounts without even getting the errors about the Male icons in RaceChangeWnd and the game works fine. [Wed Jun 20 23:35:45 2018]00632:Resetting game UI. [Wed Jun 20 23:35:45 2018]00633:UI Reset. [Wed Jun 20 23:35:45 2018]00634:Initializing UI. [Wed Jun 20 23:35:45 2018]00635:Initializing UI manager. [Wed Jun 20 23:35:45 2018]00636:Initializing fonts. [Wed Jun 20 23:35:45 2018]00637:Parsing UI XML. [Wed Jun 20 23:35:45 2018]00639:INI file .\UI_name_server.ini loaded. The on-screen message says "Entering THEN Eastern Plains of Karana". The robe ornament "Zapper's woundrous robes of thaumaturgy ornament" looks more "bulky" on my froglok than earlier, I think. Also, most of my wizard spells still share spell icons with each other. I was hoping the Icon-update would give all spells individual icons... or at least each "spell-line" individual icons. My froglok toons with heroes forge armor (wearing the tipsy set) is missing the connecting portions at joints between each piece. I have no elbows, knees, wrists or nether regions! Spell icons when placed on a third hotbar show as a black square. Using either classic spell icons or default spell icons. “Two pieces of Berserker only HH Sebilis gear have the wrong slots. There's a couple issues with "Pack" potions from the DB Store. 1. For some users, after purchase, the pack appears in inventory, but after right clicking on it, nothing happens - the pack just poofs. The potion does not appear in quest reward window, /claim, or inventory. I've purchased pack potions on both TLP and LIVE, with the same result - pack poofs, no potion. 2. It appears some users are able to get the potion, however it is not giving a potion with the correct level. So a character that is less than level 60 purchases a potion, but receives a level 60 potion, which is not usable by the character. This is occurring on TLP. “There's a couple issues with "Pack" potions from the DB Store. instead of right clicking, inspect the item, then click on the little button next to claim. I'll see what I can do about fixing the real issue of leaving the spell on the item, but I do not know what that is yet. I did it at 50 and got a level 40 potion... so I need more information. Available Heroic Characters are missing from two of my accounts. I'm assuming this is a bug as they were available when I checked 3 or 4 days ago when creating new toons. I can confirm...I'm level 46 on Coirnav, and instead of getting the Bottle of Clarity VI (lvl 40), its giving me the Bottle of Clarity V (lvl 30). 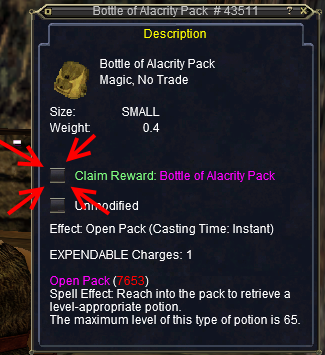 On the otherhand, for the haste potion, its giving me the Bottle of Alacrity VI (lvl 40). Looking into this and I think I know the cause. Thank you for the report! Deceiver's Conflagrant Leggins aren't giving the correct poison. It says it gives Bite of The Shissar XIX but the spell icon after using it that says X and it identifies as XI but the leggings say you should get XIX. The forage refresh bug is still there. Click forage, zone while it's refreshing, and the forage key won't refresh and is unusable until you zone again or log in/out. Also, on one of my accounts, if I make a hotkey for run/walk and put it on a hotbar, the label won't switch back and forth like it does on my other two accounts. It correctly switches between run/walk if you click it in the actions window, but not if you make a hotkey. Small thing but Show My Helm isn't working properly. 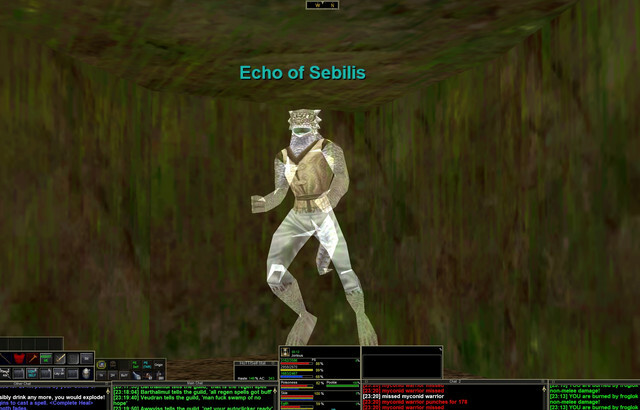 If you log in a char that has it unchecked then switch to one that has it checked your first char will show a helm sometimes in the char menu and sometimes in game. It acts real buggy. If you turn it on and back off again that fixes it until you load another char with it turned on.